It’s been so nice being back in the Dominican Republic, exactly 1 year later. Although it’s only been a few days, I can’t help but feel nostalgic as it brings back so many memories of new friendships and new experiences. My favorite thing about Dominican Republic is the beaches. I can remember it so vividly, arriving last year and running to the beach completely in awe of the beauty in front of me. It’s the most turquoise waters and the softest white sand I had ever felt, and it goes on for miles! I love the beach and I don’t discriminate, white sand, black sand, pink sand… I love them all. In fact, some of my favorite summer moments have been on the beach with sand in my hair and the salty breeze on my skin. After all, I’m a mermaid at heart! The amazing thing about scent is that it is one of the senses that has the strongest tie to memory. 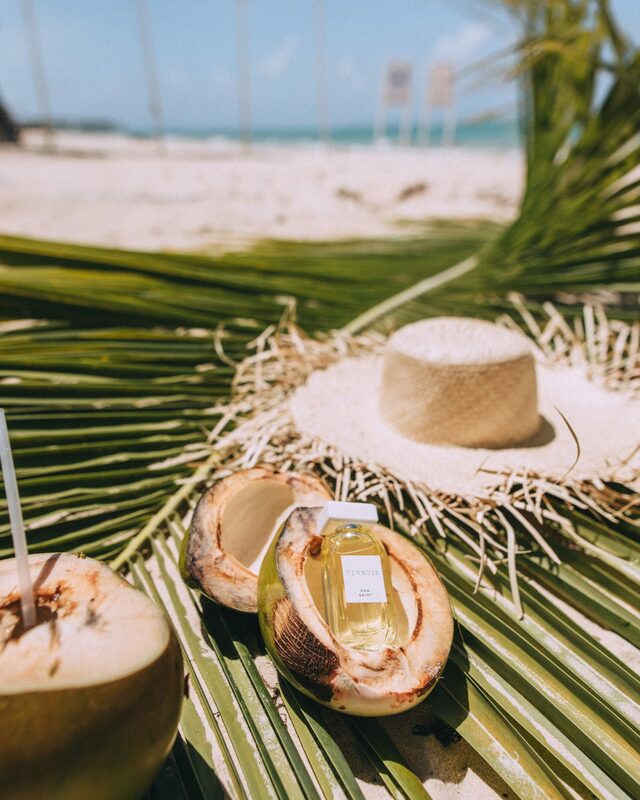 Then there are some perfumes I just can’t get enough of… With scent notes of sea salt, lime and coconut my new favorite scent, Sun Saint from Pinrose is described as ‘basking in the glow of this breezy ocean and coconut blend. Perfect for sun-kissing and skinny dipping’, both right up my alley. No wonder it’s considered my best perfume for summer! Ever since discovering Pinrose Sun Saint it’s quickly becoming my new signature scent. I haven’t been able to leave the house without a spritz! The best part about it, you can smell like a summer pool party all year long! It’s also cruelty-free & free of animal products, paraben, phthlalate & gluten free and safe for humans and animals alike. Curious to know what scent is you? Take the quiz. I was so surprised to see that it was so spot on! Out of the 9 new scents, the bottle Sephora sent me was the exact results of the perfume quiz I took, and totally me! Sephora is the one store I can never walk out of empty-handed, I go in for one thing and always leave with 4 more. Recently I went in to get my beloved Nars Velvet Matte Skin Tint and I was heartbroken to hear that it had been discontinued and adapted into a stick. Typically I’m not a stick fan but I decided to give it a try. I’ve now been using The Nars Velvet Matte Foundation Stick every day here in the Dominican Republic and I love it! It’s so lightweight and feels like I’m not wearing anything! I also picked up a few other goodies that I thought I’d share because I’ve been loving the way it’s making my skin feel. If you end up discovering any new products from this blog post please let me know in the comments!! Will definitely have to check this out! I have an obsession with perfumes and what’s one more right?! haha! Hahaha I’d love to hear what you think if you did get it! I took the quiz and yes, it is bang on. The scent it came up with for me is powdery and musky and soft which is totally my style. Unfortunately, this company only ships within the United States. As a Canadian, this is very disappointing. Oh no really? But it’s available on sephora.com.. I think you can order it to Canada from there. I’m Canadian too and mine was sent straight to Montreal. 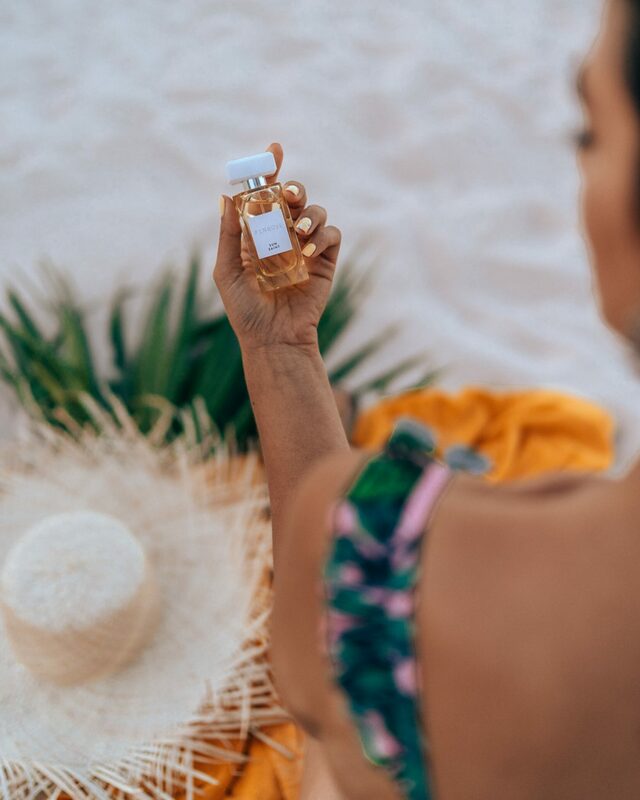 PINROSE Sun Saint is like the perfect sunkissed skin after a day relaxing on a remote beach. OMG yes!! It’s my favourite summer scent! !